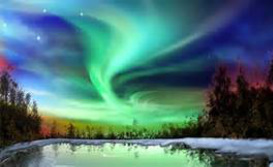 An aurora is what happens when earth's magnetic field is invaded by the electrically charged particles of the sun. These particles mix with the earth's gases and give off light. They are most easily seen at the northern pole region of the earth, where there are longer periods of darkness during the winter season, from December to March, in this part of the world. A common term for this phenomena (occurance) is: The Northern Lights, but the scientific term for this occurance (phenomena) is: aurora.